Congress weighs a change that ends U.S. subsidies, but farmers here prefer a plan that could cost consumers. 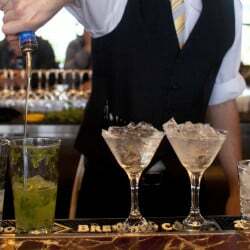 WASHINGTON — It was one of the simplest yet most acclaimed marketing strategies in recent decades. A simple slogan for a seemingly simplistic staple of the American diet — and one that belies the absurd complexity of the policies that undergird the nation’s multibillion-dollar dairy industry. Dale Cole’s dairy operation is a case in point. Cole Farm is in Sidney, about 60 miles from Oakhurst Dairy’s processing and pasteurization facility near downtown Portland. Within 48 hours of being loaded onto tanker trucks at the farm, milk from Cole’s 85 cows could be chilling in the dairy case at the Hannaford supermarket one-quarter mile from Oakhurst’s plant or the Shaw’s about 10 miles from Cole’s farmstead. But despite the hyperlocal nature of that milk, the price that Cole and other farmers are paid isn’t based on local feed, fuel or energy costs. Instead, those payments are determined by — among other things — how much “cheese traders” paid for cheddar on the Chicago Mercantile Exchange, and the national price of skim milk multiplied by 0.965 plus the price of butterfat multiplied by 3.5. Confused yet? You’re not alone. “There are many people who work in the industry that don’t fully understand it,” said Tom Brigham, co-president of Oakhurst Dairy and, although he doesn’t admit it, probably one of the few who actually does understand. Milk can also be political. Regional tensions and power struggles pitting farmers against processors — or big dairies versus small — frequently surface in Congress. Just last week, a massive Farm Bill affecting all of agriculture failed in the House at least in part because late changes to a dairy safety net program prompted some milk state lawmakers to walk away. With consensus building for an overhaul of federal dairy policies, the House and Senate are considering proposals to replace government “safety net” subsidies with a voluntary price insurance program. 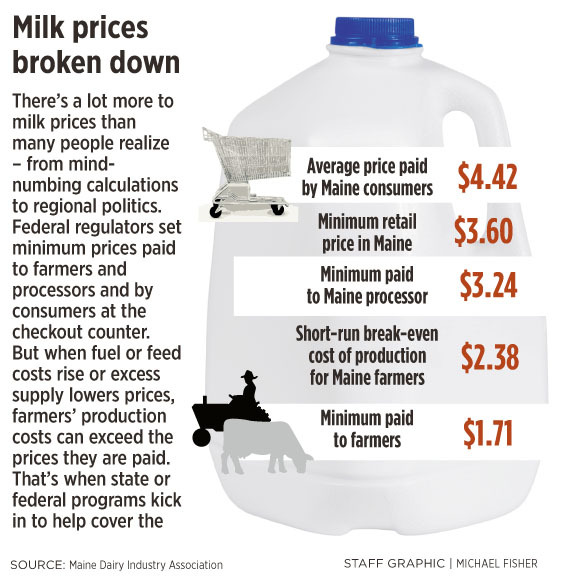 But many Maine dairy farmers, who argue that under the current system there is little to no correlation between their production costs and the federally set minimum prices they receive, are also less than enthused about the proposed reforms. “What we really need is a regional approach to it because one shoe doesn’t fit all of the regions of the country,” said Cole, who currently serves as president of the Maine Dairy Industry Association. But why should consumers in Maine care about dairy policies set in Augusta and Washington, D.C.? Or about the regional politics that sometimes pit New England’s much-smaller dairy industry against powerhouse milk-producing states in the Midwest? For one, the federal government sets minimum milk prices (and retail prices for a gallon rose 31 percent between January 2003 and January 2013). But for Maine and its New England neighbors, the old farmhouses, large barns and tended fields visible from scenic byways are often integral to both the agriculture and tourism economies. The financial plight of Maine’s dairy industry has been well documented. Squeezed by rising fuel and feed costs, many of Maine’s roughly 300 dairy farms have struggled to recoup enough money from milk sales to stay in the black in recent years. State and federal programs designed to help dairies weather volatility in the milk industry have provided a lifeline for many farms, with one federal program funneling more than $3.5 billion in subsidies to dairy farmers nationwide since 2002. But that safety-net program — called the Milk Income Loss Contract program — would be eliminated under the House and Senate proposals to offer farmers a voluntary “margin insurance” to help cover losses. Milk remains one of the few agricultural commodities that, despite globalization, is often produced and consumed locally, especially in New England. The towering silos visible at Oakhurst’s Forest Avenue processing plant each holds 40,000 gallons of milk, all of which is currently supplied by a network of roughly 70 Maine farmers. 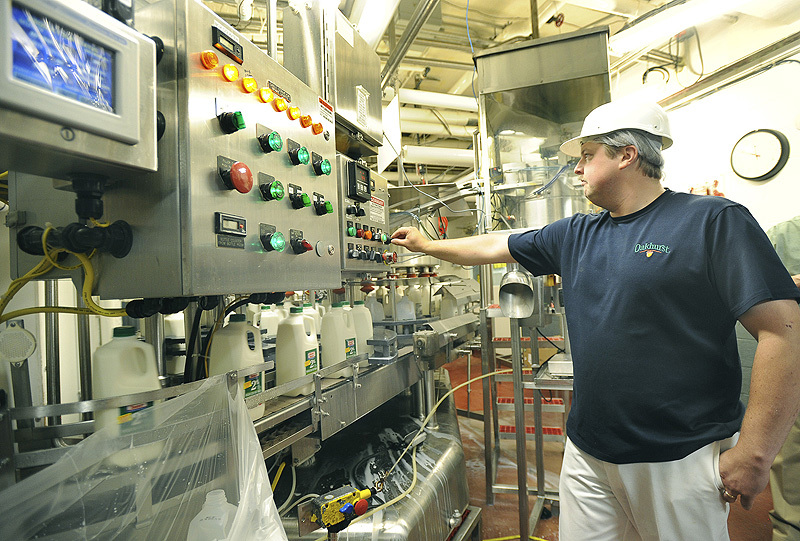 Likewise, the other major processor still operating in Maine — HP Hood’s Portland plant — is also currently buying all of its milk from Maine dairies. Ten tanker trucks arrive each day at Oakhurst. Inside, empty one-gallon plastic bottles whiz along conveyer belts until they are filled in seconds by a machine, crated and prepared for delivery. From farm to retail store ideally takes 48 to 72 hours, said Oakhurst co-president John Bennett. Maine’s dairy industry is estimated to be worth $570 million annually and employs roughly 4,000 people. Farms range in size from a few cows to 1,500-head herds. But there’s a lot more to milk than meets the taste buds. Hidden behind each gallon is a labyrinth of milk classifications (with milk for drinking, yogurt, cheese and butter each given its own class), minimum price-setting schemes, and federal subsidies. Then there are price differentials based on how far a farm is from a regional hub, which in Maine’s case is Boston. Even the way milk is measured — by the “hundredweight,” equivalent to between 11 and 12 gallons — can be confusing. States add their own layers of complexity. In Maine, processors pay a premium of about 13 cents on every gallon that funds a farm support program. Maine taxpayers also finance a separate multitiered program that provides financial assistance at times. “It certainly makes our business more complicated,” Hood spokeswoman Lynne Bohan said of the myriad of state laws that the company must navigate. MILK POLICY NEEDS FIXING, BUT WHO PAYS? Even so, all of this complexity has a simple, even noble goal, according to advocates. Neither Smith nor Cornell University agricultural economics professor Andrew Novakovic believes milk policies are as complicated as everyone makes them out to be. Compared with his taxes, federal milk policy seems fairly straightforward, Novakovic said. That’s not to say, however, that they couldn’t be streamlined or improved. The question is not only how, but who should pay. Of course, it’s an open debate about whether the current dairy price-support systems are helping the farmers who milk their cows — twice a day, seven days a week, 365 days a year — in order to satiate our appetite for all things dairy. Some argue that the federal pricing policies and subsidy program should be scrapped altogether, thereby opening up the dairy industry to the free market. Sallie James, a trade policy analyst at the Cato Institute, said she believes the myriad of policies are increasing the price that consumers pay for milk by essentially providing “welfare” to some farms, discouraging systemwide efficiency and restricting imports. Farmers and others within the industry in Maine would not go that far. But many are arguing for a system that moves away from federal subsidies and more closely links the price paid to farmers with the price of milk in the marketplace — a system that could also cost consumers more. Oakhurst’s Brigham said he gets “quite involved” in dairy policy at the state level but not as much with federal policy, although he said there is a consensus among Maine farmers that reforms are needed. Yet as events last week in Congress demonstrated, reforming a federal dairy-pricing system often described as “incomprehensible” or “archaic” is rarely easy. Farm bills used to be fairly noncontroversial stuff. The current attempt to draft a new five-year Farm Bill has been dogged by controversy, however, over cuts to food stamp programs, crop subsidies and, most recently, dairy policy. On Thursday, House Speaker John Boehner and others managed to remove part of the “margin insurance” program that would have required participating farmers to limit milk production when too much supply drives prices down. But the loss of support of lawmakers from dairy-rich states, combined with anger over food stamp policies, led to the defeat of a new five-year Farm Bill. “I’ve been at this a long time, and it’s pretty difficult to get anyone to agree with anything,” said Smith, the Vermont-based consultant. 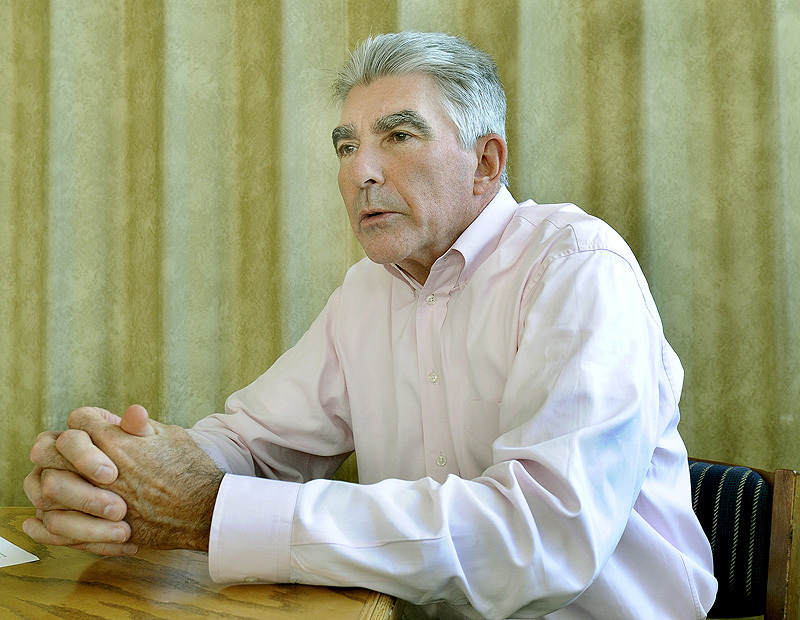 Smith has personally felt the sting of regional politics when it comes to dairy policy. In the 1990s, he was the key architect and later executive director of the Northeast Dairy Compact, a program that allowed the New England states to set milk prices. The program was widely popular with New England farmers during its four-year run. But Congress allowed the program to expire in 2001 at the behest of industry representatives from other regions who argued it would drive down prices nationwide because of overproduction and who were frustrated by the higher prices paid to New England farmers. Leahy, D-Vt., remains a powerful voice in Congress for New England’s dairy industry. Other prominent northeastern voices, such as former Maine Sen. Olympia Snowe, have left Washington. Smith, for one, believes today’s deeply polarized Congress is often less willing to delve into complicated issues. Staffers with expertise in dairy who can advise lawmakers on policy are in short supply, he said. “I’m not being disrespectful, but you can’t find any staff now,” Smith said. Still, northeastern farmers and lawmakers continue to push for broader dairy reforms. The Senate version of the Farm Bill that passed that chamber earlier this month would require the U.S. Department of Agriculture to hold public hearings around the country to solicit suggestions on other types of long-term dairy policy reform. The language was co-sponsored by Sen. Susan Collins, R-Maine, and Sen. Kirsten Gillibrand, D-N.Y.